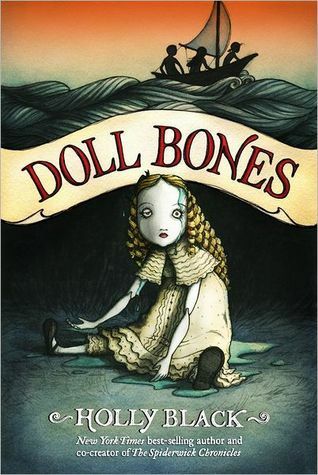 Doll Bones by Holly Black. Grades 4-7. Margaret K. McElderry Books, May 2013. 244 pages. Review copy provided by my local library. Zach, Poppy, and Alice are best friends, getting together to weave awesome adventure stories starring their action figures, a pastime that none of their fellow middle-schoolers would probably understand. But things are starting to change between them, and when Zach's dad throws his "dolls" away, Zach can't bring himself to admit that the game is done for him forever. So he lies. And the lie unwittingly sends the three friends on a quest to bury a haunted china doll... or risk being cursed forever. 1. The atmosphere. OKAY THIS DOLL IS REALLY CREEPY. And the early-fall setting, the mysterious places the doll ends up, her creepy black eyes and porcelain (maybe-made-out-of-murdered-human-bones) skin... It all sets the right tone - enough to give me shivers, but not enough to give me nightmares. This will definitely satisfy kids looking for a scary story, but the level of horror is definitely middle-grade-appropriate. This takes a delicate hand and Holly Black has nailed it. 2. The friendship between the kids. This aspect of the book reminded me of all my favorite stories from when I was a kid. I just loved all three of these kids. They're plucky and courageous and fiercely protective of each other (even if Zach lies and Poppy breaks a promise). I feel like I could read about a million of their adventures and not get tired. 3. Adventures in a library! And a pink-haired librarian!!! With fancy shoes!!!!! Basically, I thoroughly enjoyed this book and I'm really going to enjoy booktalking it and pressing it into the hands of every kid who asks me where the scary stories are. The atmospheric creepiness reminds me of Neil Gaiman, so for kids looking for another scary story, I'd hand them Coraline (the button eyes! Ahhhhh!) or The Graveyard Book. I loved the storytelling friendship between the kids, so if the characters are what's appealing, I might try The Egypt Game by Zilpha Keatley Snyder. This is another book about kids making up stories together and there's also a bit of a creepy atmosphere and a slight mystery. Doll Bones is on shelves now!